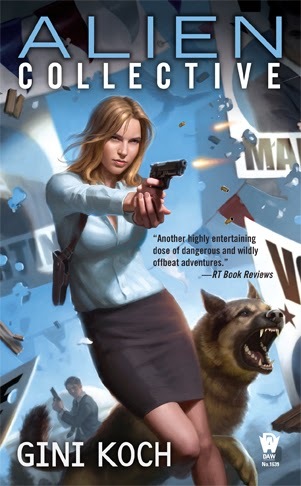 Blah, Blah, Blah...: Release Day Yapping & Winning! Happy Alien Collective Release Day! Sooo, what are all y'all doing today? Reading? Really? How...shocking. Well, to add to all that shocking, we have lots going on today. So, let's get you reading all the stuff all over, so that you can get back to reading all about Kitty! 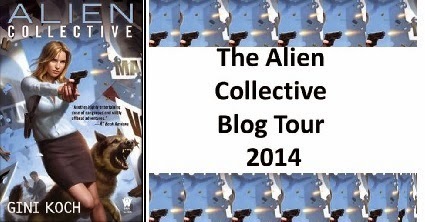 First up, the next two stops on the Alien Collective Blog Tour are live. So head over to Gizmo's Reviews where she has an interview with Kitty and a chance to win one of the first 8 books in the Alien series. And after you've read and entered to win over there, go to A Buckeye Girl Reads, where she has another interview with Kitty along with another chance to win! (Yeah, Kitty's doing all the yapping today. Seems only fair, right? Of course right!) Oh, and all the Blog Tour contests are open internationally. There's a special prize available, at these two stops as well as at Larissa's Bookish Life (contest ends TODAY, May 6), Bibliognome (contest ends May 15), and Book Girl of Mur-y-Castell (contest ends May 18), but it's for my Hook Me Up! Subscribers only. Not on? Perhaps now's the time to rectify that mistake. Send an email to gini@ginikoch.com with "Hook Me Up!" in the subject line and you'll be in and sent the special instructions! Next up, head over to see what Under the Covers thought of Alien Collective. Now it's time for some "live action" stuff. Okay, it's podcasts and videos, but that's close enough! Check out the latest More Geek Than Gay audio podcast, which include some of moi yapping at my signing at The Poisoned Pen. And then head over to Extra Me! in the Interactive Gini section, scroll down, and find my 6 short Q&A interviews for ASU's Virginia G. Piper Center for Creative Writing. If you're an aspiring author, these, and the others in the series, are well worth checking out. And if you just like hearing me run my yap, these are also a must. 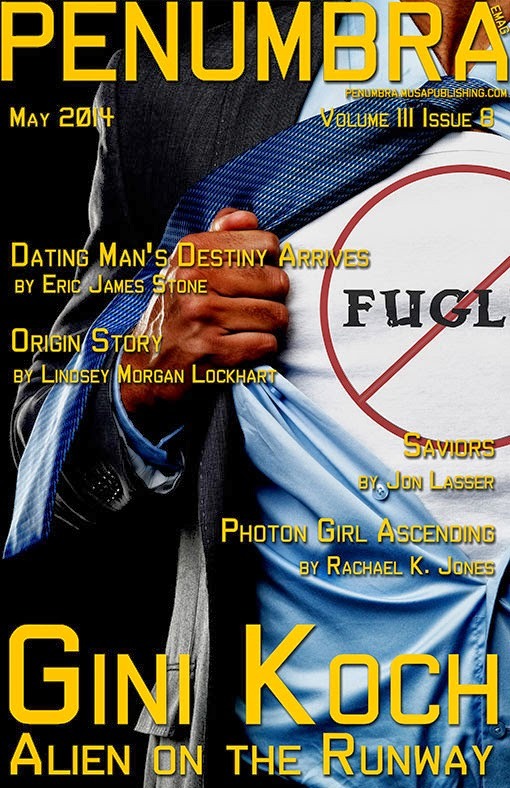 Get the May issue of Penumbra eMagazine so you, too, can read the first Alien Series short available, "Alien on the Runway". The other stories in this issue are da bomb, as well. And, if you want to keep up and get the rest of the Alien series shorts I'll have in Penumbra later this year, get a subscription! If you use 2014Gini when you order, you'll get the subscription for half price AND get the Best Of issues for 2012 and 2013, too! Offer ends August 1, and the May issue is available right now, so don't wait, get your deal, and your monthly great reading, going today! Also, the bidding is going strong at the Brenda Novak auction. Check out my fantastic Alien Pack -- and bid early and often! All proceeds go to a great charity! SoCal, I will be in you! Make your plans to see the me, and get your signed copies of Alien Collective and all the other bookie wookies, at Mysterious Galaxy San Diego, on Saturday, May 10, from 10am-5pm, I'll be speaking and signing from 1-2pm, but will be around all day; and/or see the me at Mysterious Galaxy Redondo Beach, from 7:30-8:30pm on Monday, May 12. A good time shall be had by all at each location, so don't miss out! That's it for today, but we have much more release week excitement coming your way. So, peace out, my li'l gangstas, and let's be winning readers of Alien Collective out there!